The Word STARTUP folder is the folder Word uses by default to store global templates and add-ins. When you start Word, the program automatically loads all Word files in the STARTUP folder that are in .dot, .dotx or .dotm format so they are ready for use in Word. 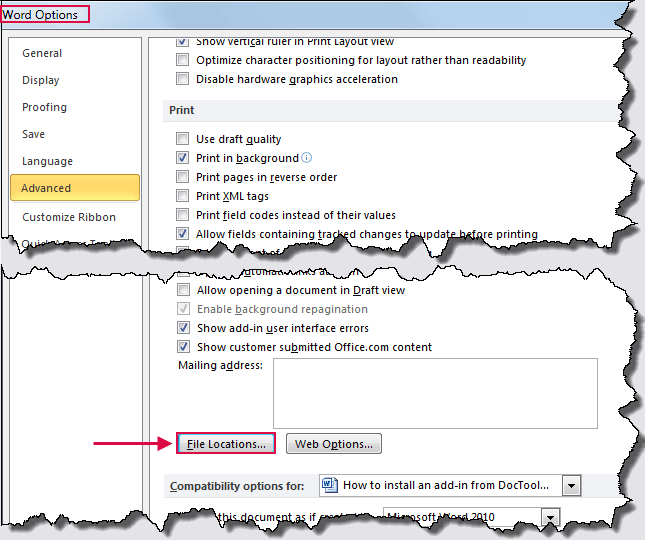 The Word add-ins provided by DocTools must be placed in the folder that is defined as the Word STARTUP folder. This article explains how you can find the STARTUP folder on your computer. By default, the folder is named STARTUP in English versions of Microsoft Word. However, the default name depends on your language version of Word. For example, the default name in a Danish version of Word is START. You can find the location of the Microsoft Word STARTUP folder on your computer using METHOD 1 or METHOD 2 below. Once you have found the STARTUP folder, it is practical to add it to the list of favorite locations. This will make it easy to always find the folder. By default, some files and folders are hidden. That is true for the Word STARTUP folder. If you cannot see the folder when you follow the procedures below, you must change a setting. See How to make hidden files and folders visible. This method is most likely faster than METHOD 2. In Word, press Alt+F11 to open the macro editor, VBE. In the VBE window, press Ctrl+G to go to the Immediate window. The path to the STARTUP folder is now shown below the line you typed as illustrated in Figure 1 below. You can copy the path and paste it into the address field in Windows Explorer and press Enter to go directly to the STARTUP folder. Figure 1. Finding the STARTUP folder via the macro editor, VBE. Word 2010, Word 2013 or Word 2016: Select File > Options > Advanced > General group > File Locations (close to the bottom of the dialog box). Word 2007: Select Office button > Word Options > Advanced > General group > File Locations (close to the bottom of the dialog box). Word 2003 or an earlier version: Select Tools > Options > File Locations tab. Figure 2. Finding the STARTUP folder via the Word Options dialog box. 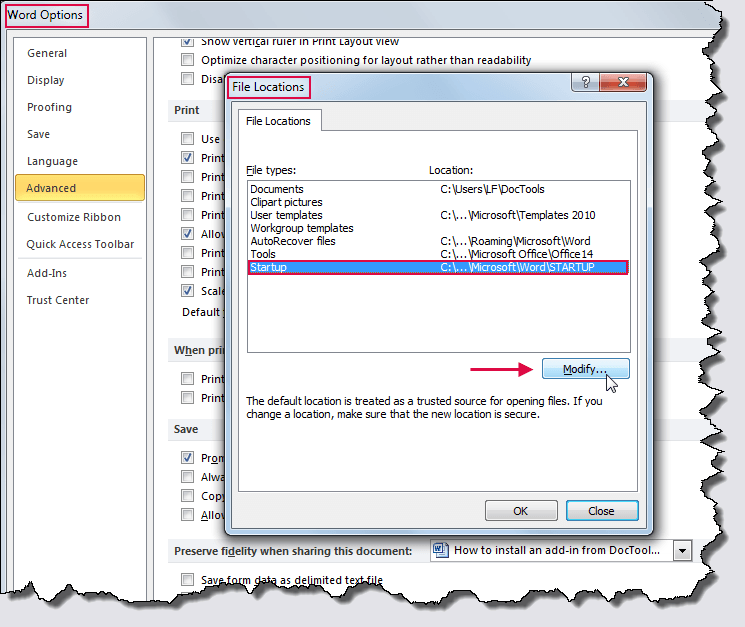 Select Startup in the list to open the Modify Location dialog – the dialog box opens with the current STARTUP folder selected. Figure 3. Click Modify to find the full path. Note down the path to the STARTUP folder. Close the opened dialog box(es) – click OK if you have changed settings, otherwise you can just click Cancel. Note that you can specify any folder with any name as the STARTUP folder. However, do not change the default name or location unless there are important reasons to do so. The default STARTUP folder is specified as a trusted location. If you specify another folder as the STARTUP folder, make sure to add it to trusted locations. Otherwise, you may have problems with functionality in add-ins being blocked. Trusted locations can be added via Trust Center below Word Options.